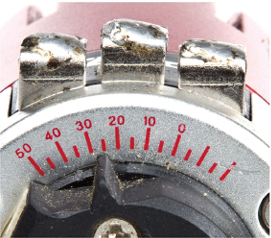 If you have a sensored brushless power system, you’ve probably noticed timing marks on the end of the motor’s can. They indicate a range of stator/sensor timing that adjusts how the motor’s RPM builds throughout its powerband, and you can adjust the timing to suit running conditions. This article will explain basic brushless motor timing and aid you in adjusting for optimum motor performance. Brushless motors work due to a simple magnetic principle: opposite (different) magnetic poles attract and opposing (same) magnetic poles repel. This simple principle creates the rotational motion of the motor. 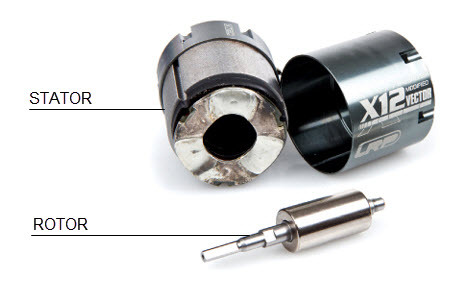 The magnetic portion of the brushless motor consists of two parts, the rotor and stator. Of course, there are other components, including bearings, the circuit board, the end-bell, solder tabs, sensors, shims, etc., but we’ll concentrate on how the rotor and stator interact with each other while adjusting timing. The rotor is a simple metal shaft on which magnetic material is attached. This is the part of the motor that actually spins, and it’s what the pinion gear attaches to. The stator forms the bulk of the motor, and is made of stacked steel laminations wrapped with magnet wire to form three coils (in the case of a 2-pole motor, as shown here). Energizing a coil in the motor produces a temporary magnetic field that attracts one pole of the rotor and repels the other pole. As the rotor rotates towards the temporary magnetic field produced by the coils of the stator, a sensor in the motor turns off that coil and activates the next set of coils. This continues the rotational movement of the rotor. The point in the rotation that the next set of coils is energized is key to producing a fast motor for the type of vehicle and track you’re racing. The closer the pole is allowed to be to the coil when the coil is energized, the less timing you have, but the most magnetic effect you have on the rotor because the magnetic field generated by the energized pole is closer to the pole of the rotor it is attracting. The further the rotor’s pole is from the magnetic field that is attracting it, the less powerful the attractive force will be. 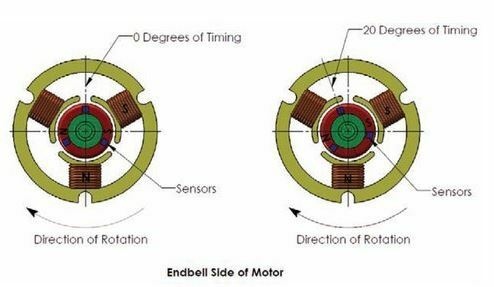 When you adjust timing by turning the motor’s endbell, you are adjusting the position of the sensors relative to the stator. A motor with lower (less advanced) timing will produce maximum horsepower at low rpm, and a motor with higher (more advanced) timing will produce maximum power at high rpm. The best timing setting does not necessarily achieve the maximum horsepower that the motor is capable of, but rather produces the maximum horsepower within the rpm range you’e most frequently using on the track. Finding the ideal motor timing setting for your car and conditions will take a bit of trial and error, but in general, you can expect heavier cars and/or tracks with shorter straights will benefit from lower timing settings. A heavier car and more frequent accelerations require more torque, which calls for lower timing. The additional RPM and speed a higher timing setting may provide are wasted if you don’t have long enough straights to exploit them. However, if you have a lighter car and/or are running on a track with long straights (or an oval), higher timing settings may increase your top speed and decrease your lap times. Just watch the motor temperature; the more you advance the motor’s timing, the hotter it will run. If your motor reaches 150 degrees F or higher during a run, it’s overheating and you should reduce timing, install a smaller pinion, or both. Because motor temp is so critical, an inexpensive infrared temperature (like this one from TrakPower, or any like it) is a very useful addition to your pit box.